The Dobrusin Law Firm is pleased to announce that Eric Dobrusin, Dan Aleksynas, and Kristen Pursley have been selected for inclusion in the 2019 edition of The Best Lawyers in America©. Mr. Dobrusin, a founder and shareholder of the firm, has more than twenty-five years of experience in intellectual property law. He focuses his practice in patent counseling and strategic patent prosecution, with particular emphasis in the fields of materials science, biomedical technologies, and automotive technologies. He has been recognized by Best Lawyers each year since 2007. Mr. Aleksynas, also a shareholder, prosecutes domestic patent applications before the U.S. Patent & Trademark as well as applications filed internationally, with an emphasis on automotive technologies and medical devices. He initially appeared in the Best Lawyers 2017 edition. Ms. Pursley is the firm’s managing shareholder and represents tier-one automotive suppliers, medical diagnostic and device manufacturers, and consumer product and packaging producers in intellectual property matters. She has been included on the Best Lawyers list annually since 2016. The three attorneys are also the co-authors (along with Ronald Krasnow) of Intellectual Property Culture: Strategy & Compliance, published Lexis-Nexis/Matthew Bender. Congratulations Eric, Dan, and Kristen! Managing shareholder Kristen Pursley has been named a judge in the 2018 North American MIT Inclusive Innovation Challenge (IIC), a platform for recognizing and rewarding organizations that are promoting technology as a vehicle for positive change in a world where automation poses potential challenges for employment. The brainchild of the MIT Initiative on the Digital Economy, the IIC was launched two years ago to celebrate businesses and nonprofits around the world that are using technology to solve a grand challenge of our time — to create not only prosperity, but shared prosperity by reinventing the future of work in the digital era. This year, the IIC has expanded to a global tournament model, collaborating with partners in five regions — North America, Latin America, Europe, Africa, and Asia. Detroit, where MIT has partnered with the Ralph C. Wilson Jr. Foundation, is hosting the challenge’s North American region. Kristen and other judges will choose 12 regional challenge winners to be acknowledged and awarded cash prizes at the IIC North American Celebration held in Detroit in September. Four regional champions will win $20,000 each and eight finalists will each win $5,000. Following the celebration event, four North American winners will advance to the IIC Global Grand Prize Tournament, hosted at MIT in Cambridge, MA, in October. Four global grand-prize winners, chosen from the regional winners around the world, will be awarded $1 million in prize money. 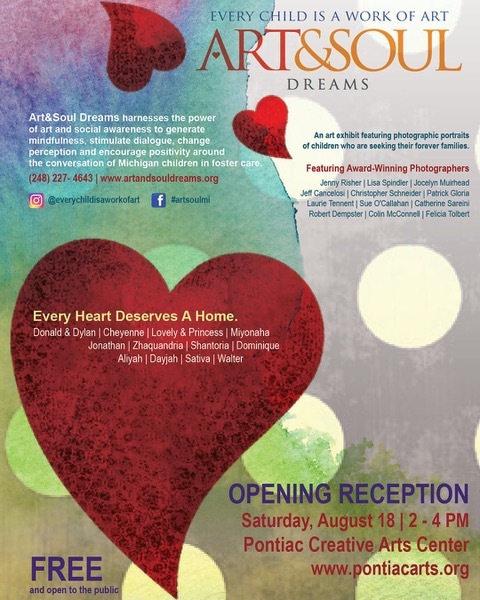 The Dobrusin Law Firm proudly supports Art&Soul Dreams, a nonprofit dedicated to raising awareness and inspiring adoption of foster children in Michigan. The organization’s mission is to change the culture and create a paradigm shift of how our society views foster children specifically, and the concept generally. To accomplish this, Art&Soul Dreams has created a traveling photo exhibit of adoptable foster children between the ages of 8-17 that quietly seizes one’s attention, opens hearts, and inspires thoughts and actions from a positive viewpoint. The photos are taken by local recognized photographers with the mission to capture the soul of the child. This year’s opening reception – a free, family-friendly event – will be held at the Pontiac Creative Arts Center on Saturday, August 18 from 2:00 p.m. to 4:00 p.m. The exhibit will continue until the end of the month. Art&Soul Dreams has had success in matching children to their forever families and they are hoping to continue the success through this exhibition and help from others spreading the word. For more information about supporting its important mission, please visit: www.artandsouldreams.org. Recently, the U.S. Supreme Court addressed the authority of illegally appointed administrative judges, and though the decision did not speak to questionable appointments at the U.S. Patent & Trademark Office (USPTO), there may be implications for individuals and organizations holding, prosecuting, and protecting patents. Lucia argued that SEC ALJs are “Officers of the United States” and only the President, “Courts of Law,” or “Heads of Departments” can appoint such them – none of whom appointed Elliot. The case made its way to the U.S. Supreme Court, where seven of the nine justices agreed, finding that, although SEC ALJs are “Officers of the United States,” Elliot lacked authority and overturning the sanctions against Lucia. Why does the Lucia decision pose any threat to the authority of administrative law judges at the USPTO? Consider the impact if Lucia applies equally to the USPTO, the SEC, and other federal agencies. When the result of a patent examination is unfavorable to the Applicant, the Applicant may appeal the Examiner’s decision to the Patent Trial & Appeals Board (PTAB), which then reviews the case and issues a binding decision. Within the PTAB’s branched hierarchal structure, the first tier includes a Chief Administrative Patent Judge (Chief Judge) and Deputy Chief Judge who decide petitions or may delegate authority to decide petitions. The second tier has two divisions of judges and attorneys led by a Vice Chief Judge, and under them are a variety of judges in different “sections.” each focusing on certain technical disciplines. In Lucia, the Supreme Court found that SEC administrative judges are officers (rather than employees) and thus subject to the Appointments Clause. The Court identified that to qualify as an officer, an individual must (1) occupy a “continuing position established by law”; and (2) exercise “significant authority” pursuant to the laws of the U.S., according to the case law precedents. It would seem that PTAB judges qualify as officers since they both occupy a continuing position, the position is established by law, and the judges have significant authority in the ability to make final rulings on the intellectual property rights of U.S. citizens. Furthermore, the function of PTAB judges substantially mirrors the qualities of SEC administrative judges as described in Lucia. Are PTAB Administrative Judges “Inferior” or “Principal” Officers? (1) the degree of supervision over the officer in question by a principal officer or those in the principal officer’s supervisory line; (2) whether the officer in question is removable without cause; and (3) whether the decisions rendered by the officer in question are reversible. An example of how these criteria are considered can be found in Estes v. U.S. Dept. of the Treasury, which ruled that the three factors are not weighted independently and equally – strength in one can offset weakness in another. For instance “the power to remove officers… is a powerful tool for control” (indicating an inferior officer) and overpowers other factors such as an officer who maintains a high degree of autonomy (evidence tending to suggest a principal officer). Degree of Supervision: It is unclear how the Secretary of Commerce supervises or directs the decisions of the Chief Judge, if at all. It is also unclear to what extent decision making is delegated. Considering the volume of cases, the degree of technical skill required of a judge, the number of judges and attorneys, and the level of hierarchical fractioning, it would seem nearly impossible for the Secretary of Commerce to exert any substantive control over the operation of the PTAB. Thus, it is probably safe to say that PTAB judges lean strongly toward the side of principal officers as they exercise a high level of independence. Removable Without Cause: Although USPTO employment policies regarding PTAB judges are not helpful, it is safe to assume that the judges, who are chosen internally from Examiners or from extensively experienced legal patent professionals, would not be treated as expendable employees or dismissible without cause. The requisite skill required of these judges suggests that the USPTO does not have an appreciably large pool of applicants to draw from – hinting at an organizational aversion to turnover. In Question or Reversible Decisions: Decisions regarding petitions are final within the USPTO. Applicants may seek post-decision relief in an appeal to the Federal Circuit. While technically, PTAB judge decisions are “reversible” on appeal, even federal district and circuit court judges’ decisions are appealable to a higher authority (both types of judges are appointed by the President). Thus, the fact that a PTAB judge’s decision can be appealed to a federal district court does not seem like a disqualifying characteristic for being considered a principal officer. “In question or reversible” likely refers to whether the bona fide principal officer (the Director or the Secretary of Commerce) can alter the decision of a PTAB judge. As it stands at the USPTO, the Director nor the Secretary of Commerce has any such power. As clarified by Lucia, PTAB judges are likely officers, and under the Intercollegiate framework, they are likely principal officers. Thus, there is a very strong argument that the Patent Act illegally confers the appointment of administrative patent judges to the Secretary of Commerce where their appointments should only flow from the President. Lucia made waves in the arena of administrative law and those waves may splash over into the hallways of the USPTO. A Supreme Court ruling like Lucia will surely embolden those eagerly waiting for the opportune time to bring suit. What chaos might follow such a paradigm shift? The Court in Lucia overturned the decision of the SEC administrative judge so the likely result of a constitutional challenge of the Patent Act would be a whole host of invalidated decisions and retrials by properly appointed PTAB judges.